If you've ever taken a Yoga class, you've probably heard the music of Deva Premal & Miten. The music of this extraordinary couple has become the soundtrack for just about every 21st Century healing modality and is played in massage and meditation studios worldwide. German-born Deva Premal is a classically trained musician who grew up singing mantras as bedtime songs. Her mother plays viola da gamba and her father was an artist and a devotee of the Eastern spiritual path, including Zen and Yoga. He taught himself Sanskrit and meditated daily. Miten was born in London and grew up in the 60's. He established a successful career in the 70s as a singer/songwriter, touring with such bands as Fleetwood Mac, Lou Reed and Ry Cooder. After reading a book by Osho, Miten left everything he had known, even selling his guitars, and travelled to India to be in the community that had gathered around Osho. It was here that he found a new approach to music and met Deva Premal. Manose was born in Kathmandu and began his musical journey with a rigorous training in classical Indian raga. Later he brought the sound of the bansuri to many musical genres, from jazz to Celtic to being a founding member of the most popular rock band in Kathmandu. 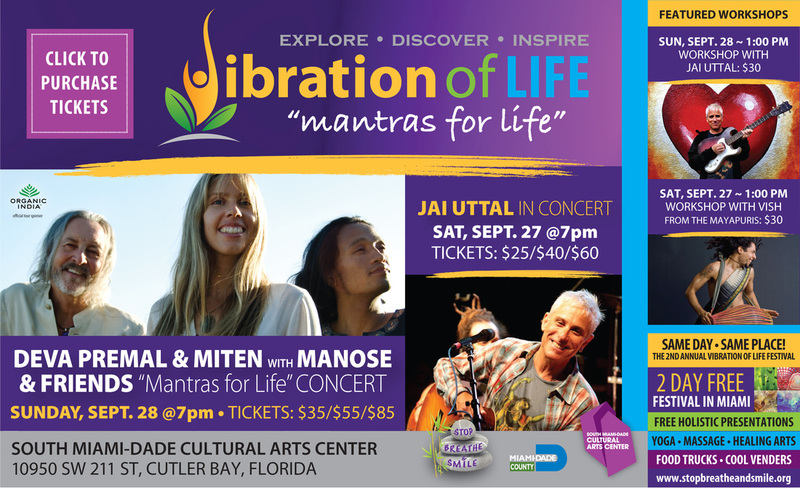 Manose has performed extensively with Deva Premal & Miten and is featured on many of their recordings, including their new album, MANTRAS FOR LIFE. Deva Premal’s pure voice and the ancient mantras she sings are a potent combination that is calling to an ever-increasing number of people. Her soulful rendering of these timeless sounds strikes a powerful chord – whether it’s for a private audience with the Dalai Lama, motivational speaker Anthony Robbins, actress-singer Cher, or in front of thousands of adoring fans around the world.